As I mentioned in our "Best Kdrama Recommendations for Beginners" post, Rooftop Prince is a great place to bridge the gap between rom coms and full-on historical dramas. It mostly takes place in the present, but it has just enough major plot points taking place in the past that you can't just fast forward through those parts. So let's take a look at what makes it tick. This was a drama that I almost quit after the first episode. A lot of stuff happened, but I just felt so bored by the whole thing that I wasn't sure if I could continue. As it turned out, once I just sat back and enjoyed the ridiculous ride, I had a grand ole time. Am I going to watch Rooftop Prince over and over and over again? Probably not. But I would still recommend it to others. Awwww. I want to be their best friend. The plot was pretty fast-paced, the murder mystery kept me guessing until the end, and the romance was cute, but I feel like all of these positive elements were massively eclipsed by the supremely awesome friendship between Lee Gak and his minions. They're like a time-travelling F4, only their scenes are funny on purpose instead of on accident. (Can we all just pause and remember Woo-bin's gangsta English and Yi-jung's five-minute-long, super creepy old man saxophone solo in BoF?) These guys were the highlight of the show for sure, and I got giddy every time their wacky "adjusting to modern life" theme song started to play. They even look the same when they cross dress. 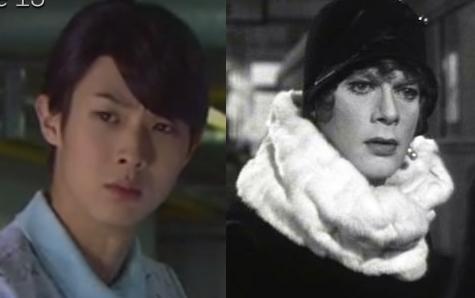 Also, random observation, but speaking of k-drama Hollywood lookalikes, Chi San totally looks like Tony Curtis in Some Like It Hot. ....I just spent five minutes staring into space reminiscing about all of my favorite scenes with these guys while giggling to myself. It has short-circuited my ability to think about anything else on this show. Let's move on, shall we? will get stuck like that? That being said, I kind of appreciate that they just went for pure evil with Tae Mu and Se Na. I like character development, but I hate those halfhearted attempts to make us like the snooty female antagonist in the last two episodes (Kang "Bras-for-shirts" Hye-won from Full House, I'm looking at you). When they give us villains who give away their siblings and murder people within the first episode, I feel comforted knowing that I'm not going to feel guilty for still wanting to punch them in the face at the end of the show. *Spoiler warning* Okay, Okay, I know that they technically tried to redeem Se Na a little at the end, but in my book, being willing to help murder only some of the people instead of all of the people doesn't exactly qualify as gold-star material. This is for the cool kids' club of people who have already seen the last episode, so stop reading if you haven't watched yet, okay? You can come back in the three days it will take you to watch the whole thing. 1. I don't know if I have just watched too many crime shows or what, but I couldn't believe how incompetent everyone was at catching criminals. Seriously. Tae Mu should have gone to jail in the first five minutes. Remember how he framed Lee Gak for murder by sticking a bag of cash into his car? Remember how he wasn't wearing gloves and his fingerprints should have been ALL OVER THE PLACE, but everyone kept saying they had no evidence? Yeah, me too. 2. The other way they could have solved their problems was by finishing their sentences. When the grandma accused Park Ha of stuff, I kept yelling at the computer, "Call your friends in New York! They will corroborate your story!" 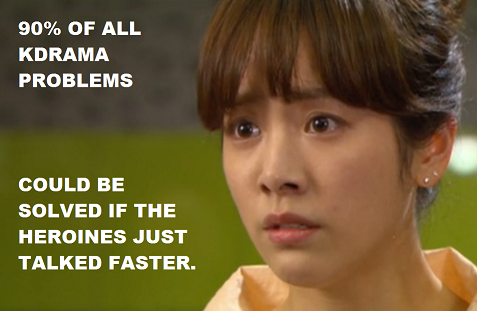 This drives me crazy in k-dramas. If someone cuts you off while you're explaining something important, don't just look startled! Talk louder! Sheesh. skills as one would have hoped. 3. Speaking of incompetence, can we just talk about how insanely idiotic Boo-young's plan was? I mean, sure, it was selfless and noble and crap, but it was also the stupidest idea of all time. Let's look at the logic: 1. You love a man enough to die for him, so you obviously don't want to get him killed off. 2. You know that there are at least three people plotting to kill him. 3. You are the only person outside of the murderers themselves who knows about this plot. And your solution is...to kill yourself without telling anyone anything? Because of some mumbo jumbo about how they won't get close to the prince if the princess is gone? Two immediate holes in this plan: 1. They tried to kill the prince again approximately five minutes later. 2. Didn't they make a big deal about how scarred her face was in comparison to the princess? How did no one notice this when they pulled her out of the water? Based on all of the crime shows I watch, I'm pretty sure bodies don't decompose in a few hours. Um, what happened in the end? They were babbling about waiting hundreds of years for love and then Tae Young appears next to her, but then he's Lee Gak in his old-timey clothes? So what does that even mean? Tae Young remembered being Lee Gak? Lee Gak somehow gazed through the veil of time, but still had to wait 300 more years to meet her? Lee Gak took over Tae Young's body? Did he live a lonely life and then die? Did he travel through time again? WHAT HAPPENED??? As someone who takes time travel physics very seriously, I need to know what that crazy ambiguous ending means. 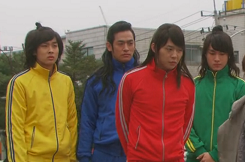 All random complaints aside, I really enjoyed Rooftop Prince. Go watch it right now and then come chat about it with me! AH! Thanks for the clarification! I guess I was hoping that wasn't the actual ending because then poor Lee Gak lived the whole rest of his life all alone. I know he technically came back as Tae Young, but that still seems very sad to me, especially since the new version doesn't remember the life of the old version. I actually took that last part differently. How the heck did vegetable Tae Young recover? But yet, there he is... My take: Although Lee Gak did get remarried in the past, so that his line could continue, it wasn't the eternal love that he shared with Park Ha. So, once all the events were done, the consciousness that is Lee Gak woke up in the body of Tae Young and went back to Park Ha. So they could finally be together instead of having to wait for *another* lifetime to get it right. And when they held hands, she realized that it was him, not just Tae Young. I think the time Lee Gak return to Joseon, Tae Young gained back his conscious since it is not possible one soul in two places the same time. and agreed with Vivi, for all Lee Gak did, he should not left being alone when return to Joseon, while watching that, i keep hoping some miracle happened to Boo Young that the real crown princess did die and she is alive to meet Lee Gak. silly! Awesome Drama. Just finished watching it few minutes back. And thanks for the hilarious review. Ending was not ambiguous as you think. They both felt a closeness and a familiarity that goes down 100ds of years. A love that was very very old but still fresh and flaming with in their hearts …. There is yet another thing that I do not understand... How the heck does Lee Gak find out about the conspiracy against him and Boo Young's "ideal plan" to save him? I thought they made him the dumbest prince in history. He sees who eats the poison and he can't remember later when his underlings tell him how his wife died ... He knew from ep 1 that the persimmons were poisoned and who ate them(it was a very memorable moment, the eating of the persimmons)!! There were so many plot holes, I tried to forgive this show, because it did start good but man did they mess it up! Oh yeah! I forgot about those persimmons! Also, why didn't she just say, "I would like to take these persimmons to my room for a snack" instead of eating them right there? NOT SMART. I love this drama too, despite the plot holes. But I hated the fact that she sat there scarfing down the persimmons and not saying a word. All she had to say was it's a trap! Check the powder! I know who is guilty. And no one would have to die. But then, that's her character all the way through. She plays the silent, noble card to the point of frustration. LOL.. VIVI, that's exactly what i think when i saw that part, she can just ask the whole plate bring back to her room and through it. she is asking the whole plate right? I just finished this tonight, and overall really enjoyed it, apart from the Tae Mu silliness which I FF'd through. In regard to Bu Yeong eating the persimmons (a fate worse than death any way in my book), I was expecting her to simply take the plate away, but think she ate them all to remove all the evidence, in an attempt to spare her family. By the standards of this drama, it was entirely coherent and logical. As for the "aaaargh!" ending, I'm sure it was TY at the very end, but that she ""saw" Lee Gak in him. I disliked that ending because it meant that poor Lee Gak really drew the short straw losing the woman he should have been with TWICE, and living a lonely life separated from her by 300 years. 2. How could people not already know it was her? I mean they fished her body out of the water right? It's impossible that they missed the fact that it wasn't the crown princess. 3. The end. While it was beautiful and all that, it was too vague. I'm not a big fan of open endings so I wanted them to be much more clear about what version of him it was. Was it Tae Yong? Lee Gak? Tae Yong who suddenly has Lee Gak's memories? Gah, just make it clear already! There were some things that I and the reviewing community doesn't agree on though. That is, based on the 10-ish reviews I've now read. 1. While I hated the character Tae Mu, I loved the actor that played him. I've read a lot of people saying that he was way too stiff and that he didn't do a good job but I think he pulled it off excellently. Especially towards the end when he had completely snapped and had the awesome crazy-eyes going on. 2. I bought Se Na's redemption. Maybe that was just because I really really wanted her to turn into a good person, but I was so happy that she did t in the end. Newly addicted to K-dramas and I am not even Korean. Wasn't going to watch Roof Top Prince at first but glad I did. Beautiful love story where love was something that was valued and treasured..hilarious scenes with Joseon prince and his 3 servants (the X-factor for the show) trying to function in a modern era, kept me chuckling.. Very well produced..the plot was good keeping me trying to solve the Crown Princess murder all the way until the very end. So far in my K-drama experience, the kissing scene of Lee Gak and Park Ha during their make believe wedding right before he disappeared was so emotional and best so far..it wasn't lustful or dry..it was perfect, I really felt the love they had for each other in that moment. Even the bedroom scene was nice..two people who love one another and just wants to be together holding each other fully clothed..tasteful and respectful I thought. The actors did great job in their roles. The villains Song Na and Tae Moo acted their roles phenomenally. Although they were the villains, there were moments of innocence and vulnerability in their roles making you sometime feel like you want to empathize with them, that is what makes them scary. Logically, I do know that there were some stupid things that just makes you scratch your head like Bu Yong eating the persimmons instead of taking the whole plate to get rid of it and switching clothes with her sister like eventually nobody would figure it out or Tae Moo leaving fingerprints all over the place when planting false evidence in Tae Young's car and no one can figure that out, I actually can really forgive all of that since it doesn't take away from the overall entertainment factor of the show. Great job all actors, actresses, producers, writers, and support crew and thank you for the wonderful K-drama experience. South Korea..you rock K-dramas !!! I love this KDrama so much! Its entertaining value is so high that I can forgive some loopholes in the plot. I fell in love with Park Yoo Chun...he is a great actor!